Free camping sometimes comes at a price. In Alaska that price is your donation in blood to the local mosquitoes. By this time we were pretty sanguine about the whole bug thing and skilled enough at decamping that we kept most of our sanity. The only local gas was in Glenallen, about 20 miles south. There we refueled and recaffeinated and doubled back towards Tok (pronounced toke). The Tok Cutoff Highway runs alongside the Copper River in the shadow of the Wrangell mountain range. It sounds cliché, but each valley we rode through brought something different for us to admire. The Wrangells are big, hairy mountains with lots of glaciers and pointy bits that make them spectacular. Lying in the Wrangell-St. Elias National Park, the largest in the US, these tall mountains are situated in the armpit of Alaska where the weather beats up the land year round. Our barman from the night before had warned us about the road to Tok. Years of rebuilding after a major earthquake rolled through the region had meant serious traffic delays. But not to worry, it’s in pretty good shape now. Once again we were glad to be on bikes as the rough road would have had us bottoming out a car's suspension. The rolling ground reminded me of the times my mother would set the dining room table for company. She’d flip a long, linen tablecloth and it would ripple across the hard wooden surface before it settled smoothly into place. Along this road, though, the ground never settled back down and we rode the standing waves like surfers. Tok is the first and last town on the US side of the border and we had camped for a night when we arrived. The highlight of our stay at the Sourdough Campground was real reindeer sausage and sourdough pancakes. On our return leg, we paused in town only for a quick lunch and more gas. As we ate, we debated briefly if we should head across to Dawson on the Top of the World Highway. All the riders we'd met who had done it recommended the detour, even the Harley and Goldwing owners. Eventually, we decided it would take too much time, besides which we needed to keep some things in reserve for our next visit. We then pointed our bikes east and retraced our steps towards Canada. 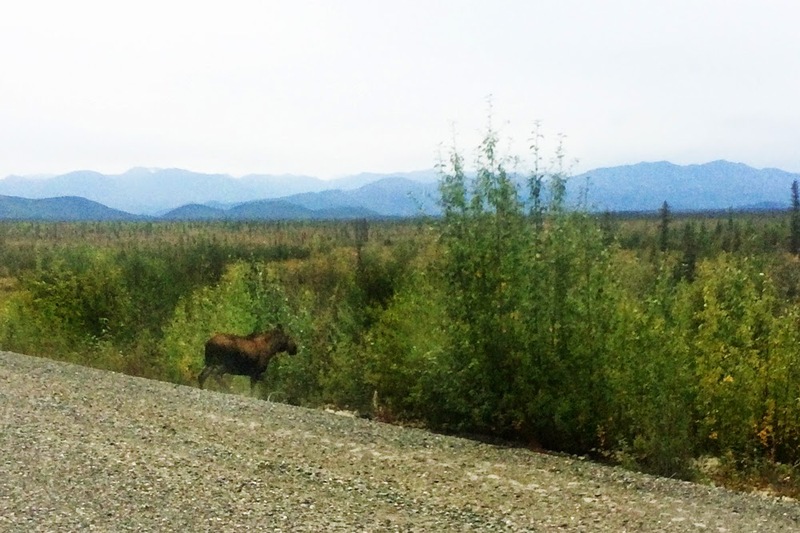 As soon as we crossed the border two moose, a doe and her calf, wandered across the highway giving us a nice photo op. 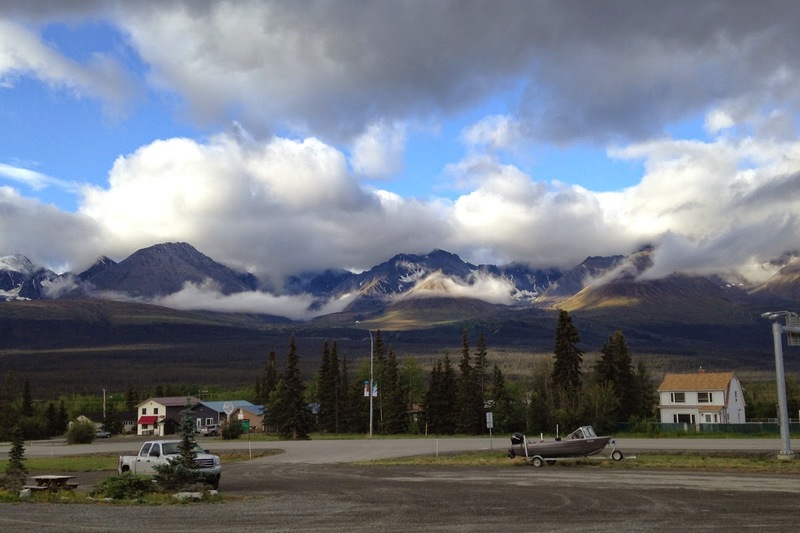 The grey weather closed in for most of the rest of the ride to Haines Junction where we pulled in for the night. That made it about 430 miles for the day. Our bodies had finally adjusted to the long distances.